The works of the 14th Century poet Hafez can be found in almost every Iranian home - more than 600 years after his death, the writer still offers an insight into his country's identity. In Iran they say there are two books in every household - the Koran and Hafez. One is read, the other is not. To understand this joke you need do no more than join the millions who regularly throng the tomb of Hafez, the 14th Century poet of Shiraz and Iran's national hero, as I did one recent afternoon. The atmosphere was buzzing, happy and relaxed - Iran at its best. Day and night the tomb, raised up on a beautifully decorated dais surrounded by its own fragrant rose gardens, water channels and orange trees, is crowded with devotees stroking Hafez's alabaster sarcophagus, declaiming his verses, relishing his clever plays on words. In today's Islamic Republic of Iran it is hard to express resistance to the powers that be. The ruling clerical elite has consolidated its grip on power. It uses the rhetoric of revolution while crushing opposition. President Hassan Rouhani's smiling face has projected a new image outside the country, but inside everyone tells me things are worse, more oppression, and more executions than ever before. But dissent can be displayed in subtle ways. 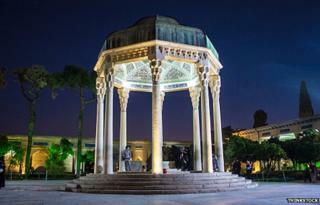 Thanks to Hafez, Shiraz is Iran's most liberal city. Women's fashion is the giveaway, affecting the whole mood of the place. While women are obliged by law to cover themselves from head to toe, in Shiraz the women dress almost outrageously by Iranian standards. Children dangle their feet in the pools, giggling and soaking up their parents' infectious high spirits. The scene conceals the paradoxes of Iran but, thanks to the Mullah's policy of education for all, there are some surprising changes afoot in Iranian society. Don't make me fall in love with that face. Don't let the drunk the wine seller embrace. The lovers and drunks don't disgrace. While the west remains obsessed with Iran's nuclear enrichment it is an open secret that the well-connected clerics and businessmen enrich themselves through sanction busting. When I hesitate over buying a Persian rug through lack of cash, knowing Western credit cards are banned from use inside Iran, the carpet dealer disregards my concerns and simply rings a friend in Dubai to seal the transaction. "Preachers who display their piety in prayer and pulpit," he wrote 600 years ago, "behave differently when they're alone. Why do those who demand repentance do so little of it?" Bans apply to many things in Iran, including the BBC, yet the BBC's Farsi is the most watched TV channel here. Facebook, Twitter, GooglePlus and Instagram are all officially blocked. Rouhani is calling for internet restrictions to be eased but the last word on such matters rests with the supreme leader, who is so far unrelenting.